In the late 1940’s the Military began using “hurry and wait” a saying that officially became one of many unofficial motto’s still practiced today. 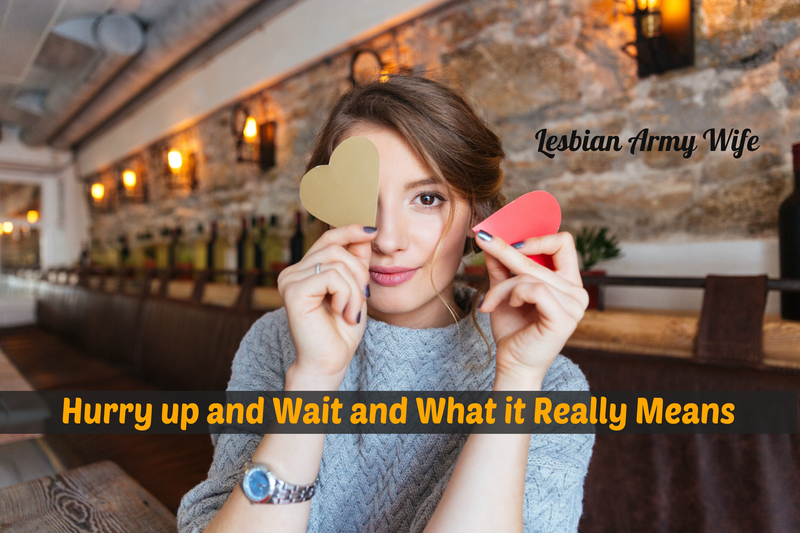 What does hurry up and wait really mean? The idea of hurry up and wait is to be ready on time without compliant or worry and be ready to what for the next thing. However, like that country song from Alabama goes “I rush and rush until life’s no fun.” Military personnel and spouses alike can be rushing and rushing until life is no fun because they are caught between being there or here and doing this or that. I think you have to find a balance between waiting and being ready especially when your spouse is in the military. My wife is hurrying up and waiting to reenlist in the military and I am excited and happy for her to start again. I have noticed ever since I met my wife she always love the Army. I could tell over time civilian life was tough for her. After a few years of marriage and taking a good hard look at what we both want out of life reenlisting in the military is the best choice for our family. However, it’s a process – your spouse waits to meet with a recruiter, your spouse finally sees the recruiter, your spouse talks to the recruiter, then your spouse’s goes back later, your spouse goes home fills out paper work, and then goes back again. Sometimes the holidays or a sick day or a leave come in between being able to sign up and reenlist in the military as I am finding out. My wife is hurrying up to wait. This whole hurry up and wait game can sometimes be frustrating. It seems like nothing is ever really set in stone. Not to mention when your spouse begins talking to the recruiter midway to the end where you can enlist, it can feel like you are playing telephone and nothing that was said at first is what actually happens at the end. Which is okay because based on different thing rank, skills, education, and open positions your spouses is narrowed down. My wife has helped to understand there is a process in the military and each process as many different outcomes. My advice is be flexible, patient and understanding. 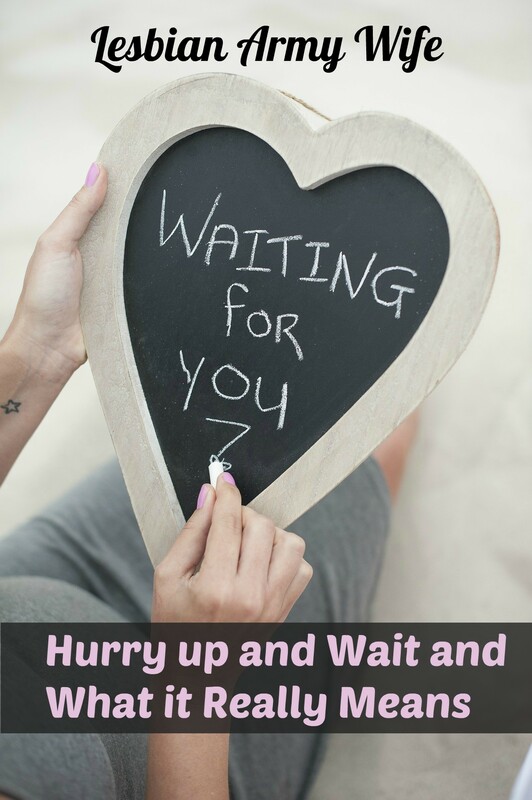 Your spouse is in the same situation you are in when it comes to hurrying up and waiting. I have create a quick list to help and remind you of what to when the whole “hurry and wait” gets overwhelming. Have plans instead of expectations – Plan for the future rather than have a strong believe that something will happen. Plans help you readjust when things don’t go as planned. Expectations can lead you to disappoint and up set because your beliefs can be crush when things don’t happen the way you want. Be ready for various outcomes – Next once you have your plan set plan some more for different scenarios that could happen. This builds flexible into your thinking and without creating disappointment. Also, thinking about different outcomes allows you to openly your mind to new possibilities rather than only hoping for one outcome that might not happen. Work on what you can control – Focus on your daily life and routines like work, school, or taking care of yourself and home instead of worrying about the unknown. No matter what there will always be times you are waiting for the next thing. It better to live in the now and do better where you can. Whether your hurrying up and waiting for your spouse to join the military, come back from training or a deployment, waiting for a promotion, to move to the next city, or to raise your child you are always hurrying up to wait. It’s just what it is. Hurry up and wait! Now that your spouse in the military get used to this type of philosophy. What are some situations you have had to “hurry up and wait” and what did you do? Share you thoughts and leave a comment!